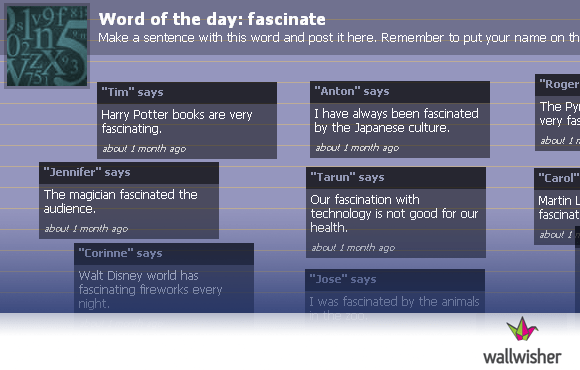 Wall Wisher can be used to informally assess student knowledge and promote discussion. To truly understand how students are learning, and to guide their performance, consider incorporating an array of formative assessments in your course design. Unlike summative assessments, such as quizzes and tests that gauge a student’s body of knowledge long after instruction has occurred, formative assessments are meant as informal “practice” activities or quick progress checks that occur as a part of a lesson. Based on learning outcomes, the instructor can use data gathered from the assessment to make quick adaptations to their teaching to support the learning process. Common examples of formative assessments include: pre-tests, polls, surveys, quiz games, and end-of-lesson “exit tickets”. There are several online tools that instructors can use to create engaging formative assessments that make data collection quick and easy. Here are 3 of the most popular free tools you can use to get started. Similar in functionality to iClicker2, Socrative is a free, easy-to-use Web-based student response system that you can use to poll students through just about any type of computer (i.e. laptop, desktop, mobile device). With Socrative, you can create and control the delivery of quick exercises, exit tickets, quizzes, and competitive games. Within minutes of creating your free Socrative teacher account, you be assigned a Virtual Classroom where you can begin creating formative assessments to share with your students. A variety of question formats are supported and all questions are saved to your account for easy access at any time. When you are ready to start polling, share your Virtual Classroom’s Room Number with your students. Students can join the Virtual Classroom using this number and the student login link on the Socrative Website or mobile app. Once students have completed your assessment, you can show them a chart of the results as well as download a report containing the aggregated results of the activity for offline analysis. MATC instructors can use Google forms, a component of Google’s free online productivity tools, to create and distribute surveys to their students through their e-mail accounts or to embed in a Blackboard content area page. Google forms can be accessed on virtually any computer device with an internet connection. But what is really great about Google forms is that it integrates seamlessly with Google Docs’ rich spreadsheet and data analysis tools. Once students have responded to the survey, the instructor can log into Google Docs to view a well-organized spreadsheet of the survey’s results. The instructor can immediately perform statistical analyses on the data, create charts and graphs that summarize the data visually, and download the results for offline analysis or sharing with students. Wall Wisher is an easy-to use tool for creating an online notice-board that you can use to ask questions by posting brief, 160-character or less, virtual post-it notes. Students can respond to the question by posting and arranging their own notes on the board. When creating a note, a student can choose to identify himself or remain anonymous. Not just limited to text, a single note may also include an image, audio clip, or video clip. Attached media will open in its own player on the wall when a visitor clicks on the note. Creating a Wall Wisher board is very easy. Just go to the Wall Wisher Website and click the “Build a Wall” button to build a customized notice-board and your own user account. So that students can access the board, be sure to keep the notice-board’s default settings in tact to allow anyone you share the wall with to be able to view and comment. To share the board with students, you can either share the URL web address of the notice-board or use the handy embed code to add the board directly to a page in Blackboard. Using any of these free tools, you can easily create engaging, risk-free opportunities for students to test their knowledge as well as collect essential feedback to inform and customize your instruction towards improving your students’ learning outcomes.